Not content with the bonfire of journalistic credibility Buzzfeed set alight on Friday, much of the mainstream media have made matters worse. Over the weekend, they directed their politicized venom at a group of teenagers from Covington Catholic School in Kentucky. And because of their political bias, they got it very wrong, again. 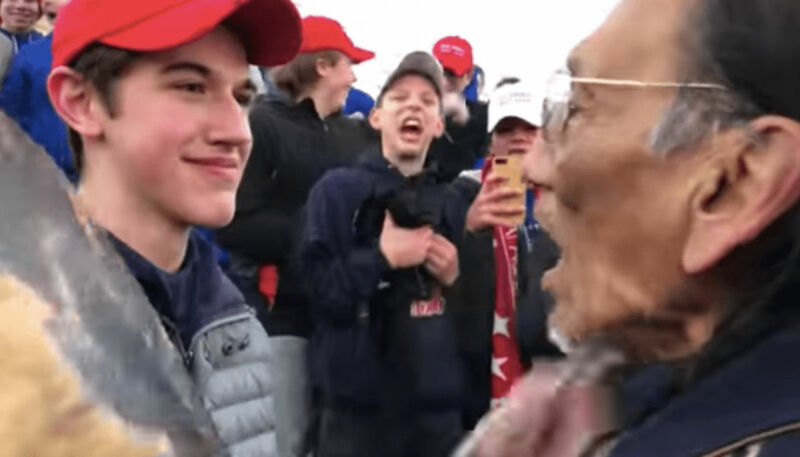 As the March for Life in Washington wound down, a video surfaced showing what appears to be a group of Catholic students, many clad in “MAGA” hats, confronting Nathan Phillips, an activist from the Indigenous People’s March. This set off all kinds of social justice alarm bells. The media leapt into action, condemning the students with ferocity and even vindictiveness. Journalists went on the offensive. CNN ran an article titled “Teens in Make America Great Again hats mocked a Native American elder at the Lincoln Memorial” but later changed the headline to “Teen in confrontation with Native American says he was trying to diffuse the situation.” Anna Merlan of Jezebel tweeted out a request for Covington Catholic High School yearbooks in what appeared to be an effort to identify, and possibly dox, the students. Former CNN host Reza Aslan tweeted “honest question have you ever seen a more punchable face than this kids” with a photo of one of the Covington students seen in the video. The apparatchiks of the social justice left piled on to ensure that heads would roll. The activist gathering site Change.org shows a petition demanding changes at Covington Catholic School, including the termination of the principal. Clearly petrified by the avalanche of bad press, the administrators at Covington initially condemned the actions of their own students, some of whom were said to face expulsion. There were even reports that Covington parents have received death threats. Unsurprisingly, this entire incident has been egregiously mischaracterized to bash the Catholic, Donald Trump-supporting teenagers, and protect some adult left wing protestors from accountability for acting very poorly. The media saw an opportunity to advance a preferred narrative of privileged, white, Trump-supporting students disrespecting a Native American elder for no reason other than a “dislike of others.” And they ran with it. But that’s not what really happened. You can watch the full video of the incident here. The truth is that these high school students were harassed, mocked, and threatened leading up to the confrontation with Philips, who chose to get in their faces and pound his drum. There were homophobic and ethnic slurs, all manners of hateful language, and all directed at the Covington students. These are teenagers who were being menaced by a group of adult males, and it was in that circumstances that Philips, clearly aware of what was going on, decided march into the crowd of Covington students. And the “Black Israelites” egged him on. Once again, the media has disgraced itself with its coverage of this incident. They could not resist the opportunity to slam a group of young men who fit preconceived notions of “white privilege.” Their clear support for Trump, of course, made them de facto guilty in many journalists’ eyes before anything was said or done. That these young men were defamed, with their lives possibly forever damaged, for the transient self-satisfaction of reckless journalists is appalling. There is much soul searching that needs to be done in newsrooms across the country. The press must be better than this, especially those who have the power of a large online platform. Perhaps the only way we can change the current climate is to hold accountable those who play into the rage mob and remind the rest of us that, no matter who you are, it is only a matter of time before the online vigilantes come for you too.